I’m pleased to announce the publication of a new journal article resulting from my work in the Giger Lab at the University of Chicago. This article, “Effect of biopsy on the MRI radiomics classification of benign lesions and luminal A cancers” investigates radiomic feature distributions of benign lesions and luminal A cancers of the breast from a database involving lesions imaged EITHER pre-biopsy OR post-biopsy (it’s very hard to locate cases in which a person was imaged with MRI both before and after biopsy.) Our hypothesis was that some features will change as a result of the biopsy process or the presence of a biopsy clip. Because it is so hard to collect single cases in both conditions, we took an approach of comparing groups of lesions. It’s part of an overall effort by our lab to understand the effects of what goes into machine learning algorithms for the purposes of computer-aided diagnosis. A lesion could be the same as another one nominally but have experienced differences in its physical state (such as in biopsy) or in imaging protocol, and we want to better understand the possible impacts on computer-aided diagnosis. As always, peer-review made a useful impact on the paper. One of the reviewers encouraged us to look at precision-recall curve performance in addition to the usual AUC metrics our lab uses, especially because the cancer prevalence was so different in our pre-biopsy and post-biopsy sets. So you’ll see that extension to the paper. I always get a lot of questions from fellow conference goers about what it is like to work on research at a primarily undergraduate institution. It’s not easy with a full teaching load, 12 credit hours each semester! I’m very proud that this paper was produced almost entirely from conception to publication without any kind of teaching release. I worked hard but also was able to work with the extraordinary folks at the University of Chicago. It takes a collection of people to do good research! SPIE Medical Imaging has come and gone. My trip to San Diego for the conference was very nice. I love that this particular meeting has different tracks (or conferences, as it is actually called within the meeting) and generally all the talks in a given track are in the same room. (But of course you can always dip your toe into the other topics, as you wish.) Another nice feature of SPIE Medical Imaging is that lunch is included each day. This means that you can prioritize meeting with other people and not having to track down food in the middle of the day. Plus, the food is always actually good! Whitney, H M., Ji, Y., Li, H., Edwards, A., Papaioannou, J., Liu, P., Giger, M L.
I also helped out with a poster on multi-parametric MRI for breast cancer diagnosis. There were lots of other good talks to see. I was especially interested in the presentations on using computer-aided diagnosis in ophthalmology. Onward to AAPM and RSNA abstract season! This marks the culmination of over 2.5 years of work and four submissions to the NIH. I have learned a lot over these years! True to the nature of peer review, each time we resubmitted, the application represented growth for me, in knowledge and in communication. I am very grateful to those who have supported me in this endeavor. My collaborators at UChicago are unparalleled in their excellence and I am grateful to be able to make use of the resources in the Giger lab in this work. The grants officer at Wheaton is an unsung hero of encouragement. Even my PhD advisor supported me by writing letters of support, even though I completed my dissertation now ten years ago. And my family has been there all the way too. When I did my first application, my kids were so little! My older son, who was (just barely!) three at the time, felt that I needed to wear a construction helmet while working on the grant, so I did so dutifully for much of that writing work. A pleasant side benefit is that my husband has been hired at Wheaton to be full time for this semester to cover my classes, so we also get a semester’s reprieve from the two body problem. RSNA 2018 is in the books. As always, there was a dizzying array of fantastic presentations, posters, and vendors. (1) a talk in the Breast Series: Hot Topics forum in Arie Crown Theatre, seen above. The authors and title were Whitney H M, Li H, Ji Y, Edwards A, Papaioannou J, Liu P, Giger M L. “Robustness of Computer-aided Diagnosis of Breast Cancer Using Radiomics and Machine Learning Classification of 3,158 Lesions across Populations in China and the United States." (2) a poster, coauthors and title were Ji Y,Whitney H M, Li H, Edwards A, Papaioannou J, Drukker K, Liu P, Giger M L. “Does Biopsy Influence Effectiveness of Radiomics in the Classification of Benign Lesions and Cancers on Breast MRI?" Both of these projects were a result of the collaboration the Giger Lab has been doing with investigators from Tianjin Cancer Hospital and Institute. Another highlight was having students in my Introduction to Medical Physics course attend the conference. The students are required to attend one “big talk” (i.e., plenary), one science session of talks, a poster session, and a vendor. It is always so interesting to read their reflections. Many are quite captivated by the dual role of science and business that is a part of the implementation of medical physics in medicine. Finally, I want to give a shout out to my husband, who held down the fort while I was at the conference. For Chicagolanders, RSNA is the conference that is so close but yet so far away. It takes me about 1.5 hours to drive to McCormick Place each day for the conference, which is not trivial. But this year, on top of that daily drive, there was a blizzard on Sunday night. So I packed a bag for my Sunday trek over, just in case, and when the news came out about how the blizzard warning would extend into the time when I was going to present, I got a hotel room close to the conference center so I wouldn’t have to worry about getting snowed out. Meanwhile, my husband handled the overnight with a 14 hour power outage with two small kids in the house - not a trivial matter! It’s always important to give credit to what’s going on in the background to make the good things happen. This summer I traveled to two conferences. The first was the International Workshop on Breast Imaging, held at Emory University in Atlanta, GA. It was a small conference, with just one series of talks. I really like that kind of format: you don't have to worry about fear of missing out (FOMO) on talks you want to hear, and it is a little easier to get to know people. I gave a talk on understanding how biopsy affects using radiomics for imaged-based classification of breast lesions. A highlight was our conference dinner at the Fernbank Museum of Natural History (seen above in the picture), where I got to chat with the representatives from Planmed, who are from Finland. Later, I went to the annual meeting of the American Association of Physicists in Medicine, held in Nashville, TN. It was a big treat to get to back to where I lived for grad school and my first teaching job, although the city is has changed so much since then. I gave a poster presentation of my work on using deep learning to classify breast lesions by molecular subtype. Poster formats are changing up all the time. I was assigned an "ePoster", which involved submitting a powerpoint slide version of my poster a few weeks ahead of time, which was magically transformed into sections that I could zoom in on by touching a button. I felt a little like Vanna White, but I think it did help facilitate discussion in some novel ways. Plus, it is always nice to not have to lug a poster tube around. A highlight of AAPM was seeing a college classmate who is now a medical physicist in Michigan and a former research student of mine who is now in medical physics graduate school. Classes at Wheaton don't start until August 29, but that doesn't mean I'm in vacation mode. 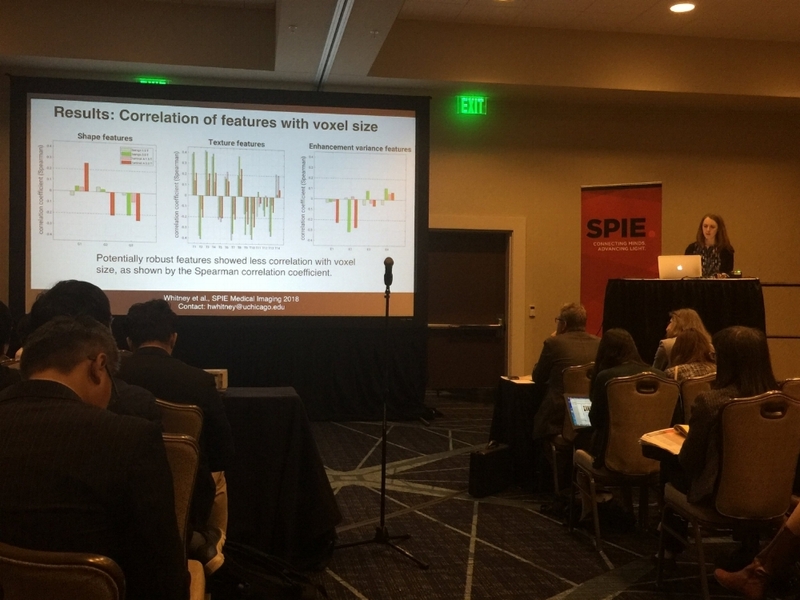 Right now the lab is working on tomorrow's SPIE Medical Imaging 2019 abstract deadline, and then I hope to get two manuscripts submitted by the start of classes for peer review. Busy but good times.